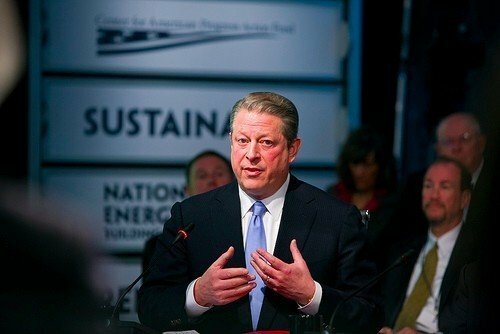 Al Gore has joined the growing list of politicians who've gone vegan, following in the footsteps of Bill Clinton, the president he served under, who famously went vegan in 2011 (though his penchant for still eating salmon probably makes him something more of a flexitarian). According to an offhand comment in a Forbes Magazine piece and confirmed by the Washington Post, the precise reason for Gore's veganism is not yet publicized, but the former vice president has for years been an outspoken climate and environmental activist, leading Matthew Prescott, the food policy director for The Humane Society of the United States to suspect that environmental concerns were behind the decision. "Overconsumption and overproduction of meat has given rise to the factory farm, which has put huge threats on the planet and our health," Prescott wrote in an email to the Washington Post. "Whether it's the whole Clinton/Gore ticket being vegan now, Oprah promoting meat-free eating, Bill Gates backing plant-based foods or the rise of Meatless Mondays, it's clear that the way we farm and eat is shifting toward a better model."